Oh how I love the mighty sweet potato. 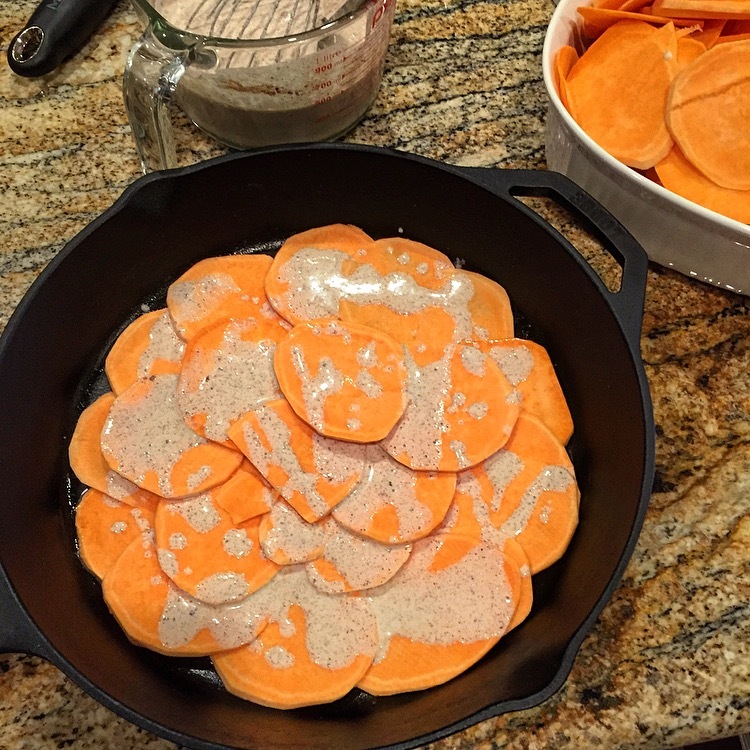 As a kid one of my favorite Thanksgiving side dishes was the iconic mashed sweet potatoes topped with toasted marshmallow…. Mmm! I mean I was actually allowed to eat marshmallows with a meal, what kid wouldn’t love that? 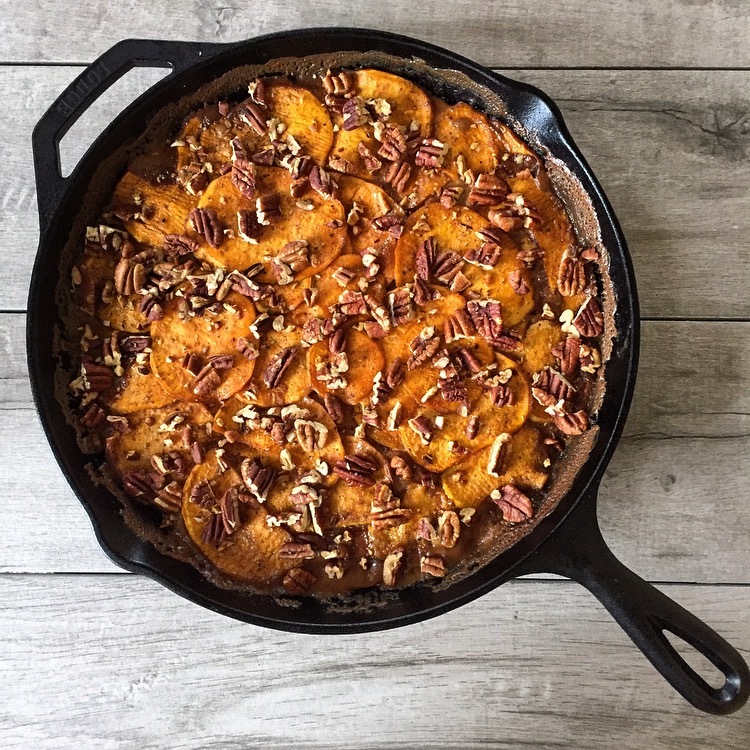 As I got older it became more about the whipped sweet potatoes topped with brown sugar and candied pecans. Yum! 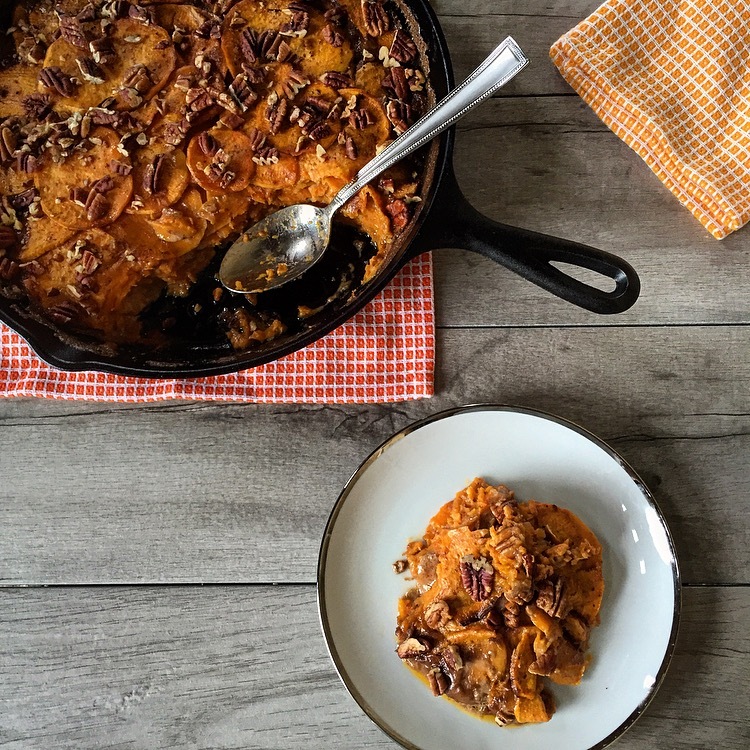 But now as an adult it’s all about this decadent spiced sweet potato gratin. Layers of thinly sliced sweet potato baked in a cinnamon, spice, and everything nice cream mixture all topped off with crunchy, salty, toasted PECANS. Is you mouth watering yet? 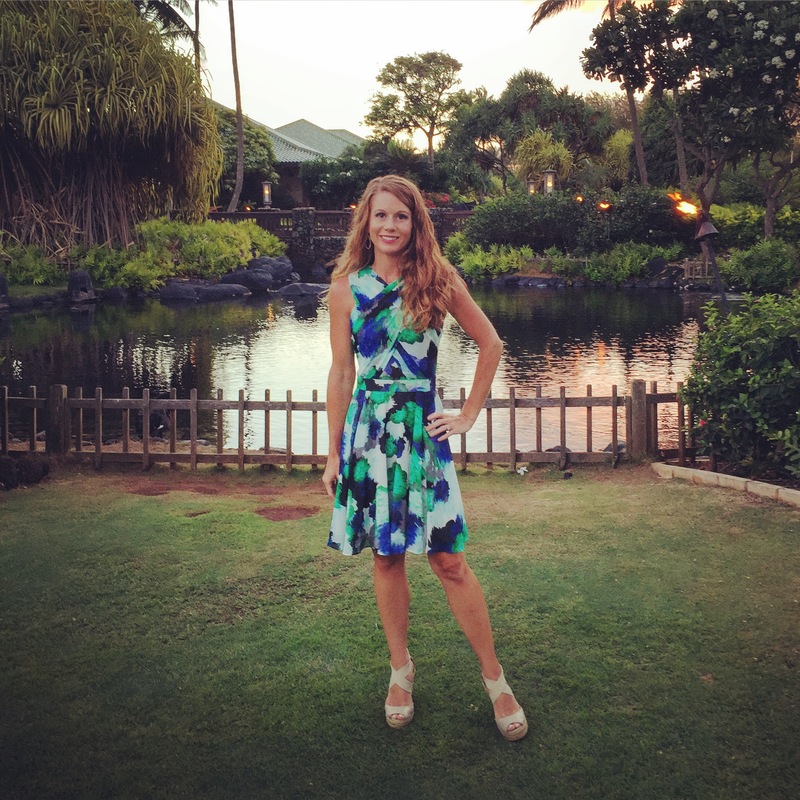 It gets better…. One flavor combination that I love is cinnamon and ancho chile powder. 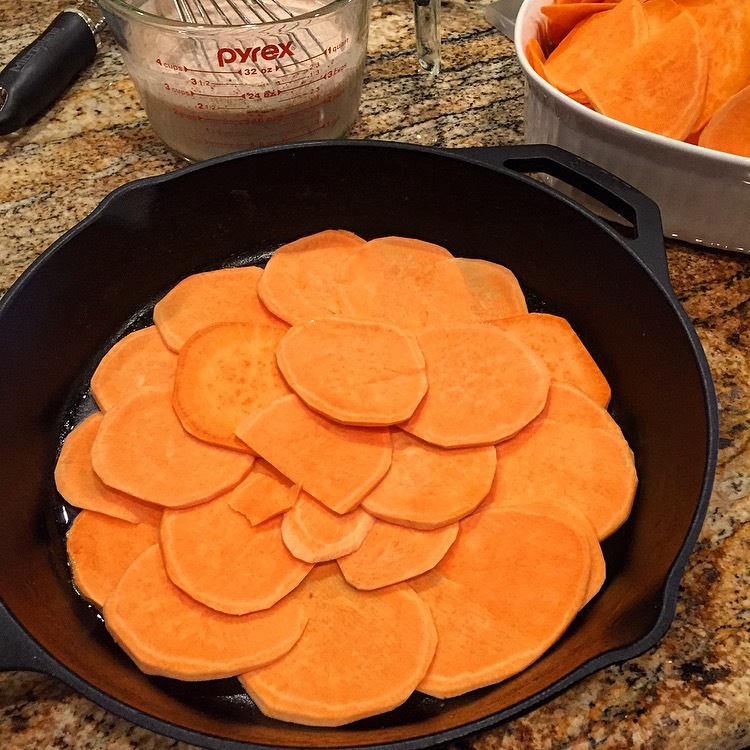 As I was mixing up a traditional Autumn spice blend for this sweet potato recipe I though why not give this Thanksgiving side dish a bit of a Texas twist? My brain waves went a little something like this…. Cinnamon, Spice, Sweet Potatoes, ANCHO CHILE Powder! I added ancho chile powder to the spice mixture and didn’t look back. The Ancho chile powder gives this sweet potato gratin a subtle smokey, mild-spicy, sweetness that compliments the cinnamon, nutmeg, cloves, and brown sugar. Then while this spiced sweet potato gratin bakes away in the oven your home becomes filled with a heavenly aroma indicative of a spice market somewhere in the American Southwest. Next time I will tell you all about the first time I ever added chili powder to a dish…. Until then. Wash, peel, and slice the potatoes about 1/8 inch think using a mandolin or food processor. In a small bowl whisk together the heavy cream, cinnamon, ancho chile powder, nutmeg, ginger, brown sugar, salt, and black pepper to taste. In a greased medium-sized baking dish with high sides ( or iron skillet… I cook everything in an iron skillet these days), arrange the potatoes in an even layer. Then drizzle with about 3 tablespoons of the spiced cream mixture. Repeat with the remaining potatoes and cream to form 8-10 layers (depending on the size of baking dish used). Drizzle the top of the gratin with 1 tablespoon of melted butter. Cover with foil and press down on the gratin to make sure all the potatoes are submerged in the spiced cream. Bake covered at 375 degrees for 30 minutes. Then uncover and bake for 30 – 45 minutes until the potatoes are cooked through, the cream absorbed, and the top is browned. Allow the gratin to set for 10 minutes and top with toasted chopped pecans before serving. I really like the idea of adding ancho chili powder to this! hahahaha!!! I think I remember you telling me about your feeling s towards sweet potatoes last year 😀. I feel the same way about pumpkin… I always hope it will taste like sweet potatoes and I’m always disappointed when it doesn’t. What a great idea to add ancho chile powder. This is very south-western indeed. Think I may use milk rather than heavy cream. I bet this recipe would also work for pumpkin! Thanks Stefan ancho chile powder and sweet potatoes are a match made in heaven 🙂 Yes I think milk would do just as well and let me know if you try it with pumpkin I would like to know how it turns out. Good to hear from for and I hope you are well!! Being originally from Texas, I know I would enjoy your gratin…it sounds delicious. When I lived at home, many a Thanksgiving included smoked turkey. Your post brought back lots of nice memories. 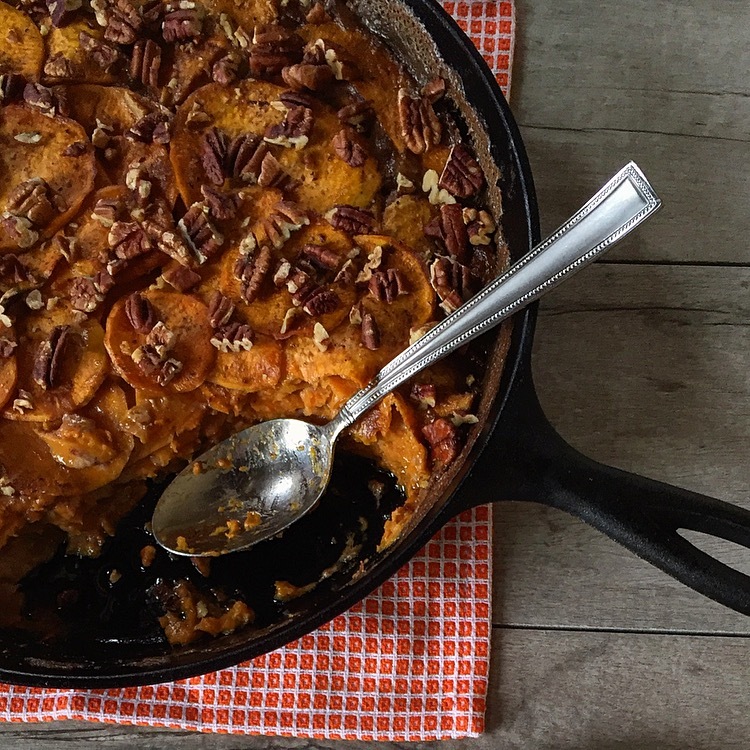 I’m happy to bring back some fond memories of Thanksgiving in Texas and hope you give this gratin a try.